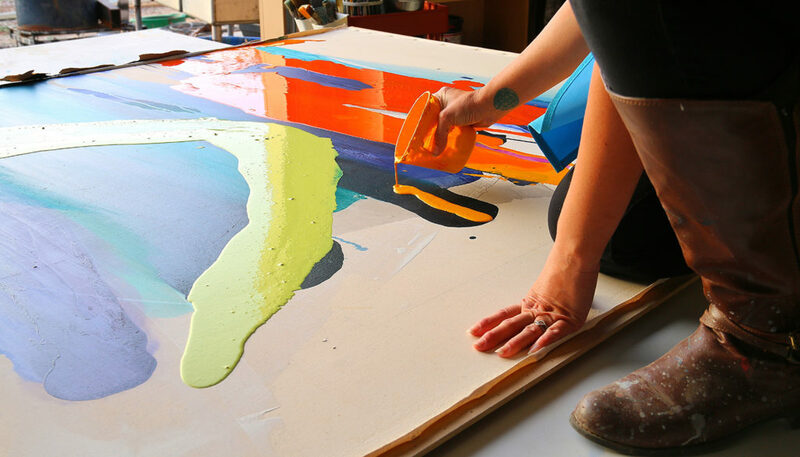 April Midkiff doesn’t shy away from experimenting with new ideas and techniques—her portfolio has included bold floral compositions, delicate paintings of human figures, and an amazing range of abstract pieces. 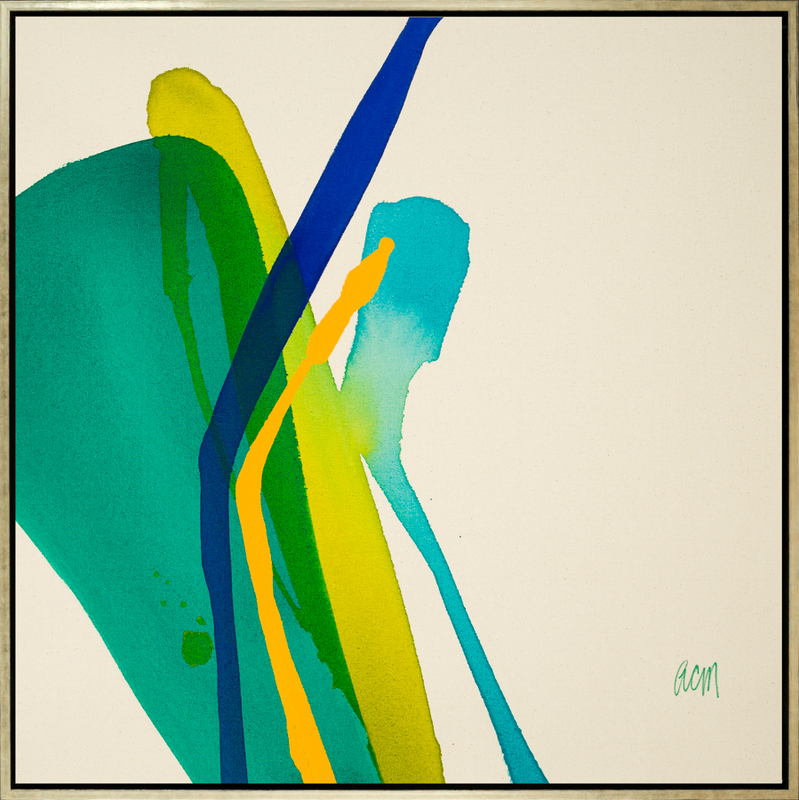 In her most recent body of work she explores color and movement, while striving to create harmony. 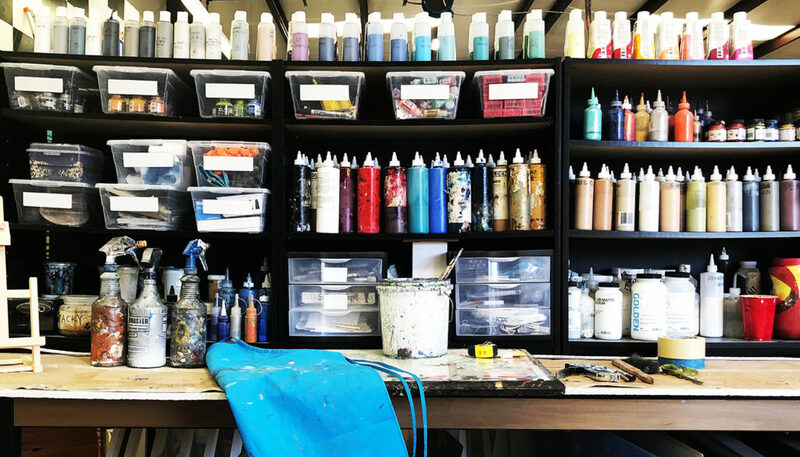 We asked Midkiff to share a little bit about what inspires her and give us a peak into her studio space. AM: The first spark of inspiration is like finding a puzzle piece. Whether it is a composition from elements in nature, a new technique galvanized by materials, or simply a color combination that evokes a certain feeling, I enjoy the contemplative process of finding other pieces to solve the puzzle. When I mentally complete the picture of what I want to create I build a mood board. These mood boards are invaluable to me—they help me visually organize my art before I pick up a brush but also serve as a touchstone throughout the painting process. As a result of my curiosity while painting, I can easily end up with a piece of art in front of me that was not my intention when I began. Sometimes that means starting over and trying again but other times it is truly fantastic! I love that about creating art! Taking the information of what did or did not work, I adjust, evolve and move on to my next work of art. As with life, I feel that art has so many nuanced lessons to teach us and that the only way to move forward is to pay attention and keep trying. AM:I am a third generation Arizonan and I could not image a life elsewhere. My love for Arizona and all of its diverse natural beauty runs deep. I met my husband in high school where we both fell in love with music and each other. We moved to Tempe, AZ to attend college at Arizona State University together. After I graduated college with a BFA in Painting, life just kept moving along and soon I was married and working for a large art production company. I was hired on as a production artist and in a couple years was promoted to a designer where I created new art for the company line. I spent 12 wonderful years learning and growing as an artist with this company. During these 12 years, my husband and I welcomed two beautiful boys into the world. I never knew my heart could be so full until they came into my life. My children remind me everyday to find happiness in the little moments and to not take things too seriously. With the addition of two gentle and sweet rescue dogs my home life is a source of great gratitude. In early 2018 I set off on a new adventure; I started my own company and am currently working for myself creating art. I thoroughly enjoy the flexibility of owning my own business as well as having complete artistic freedom over my art. Life is so good. AM:I trust my instincts/desires and go with the flow. This has led me to explore creating art in various mediums, techniques, and subject matters. With my passion for trying new approaches, my art has understandably shifted a few times throughout the years. Currently, however, I have come to a place where I feel well rounded and at home. Throughout college I leaned heavily abstract with abundant spontaneity. 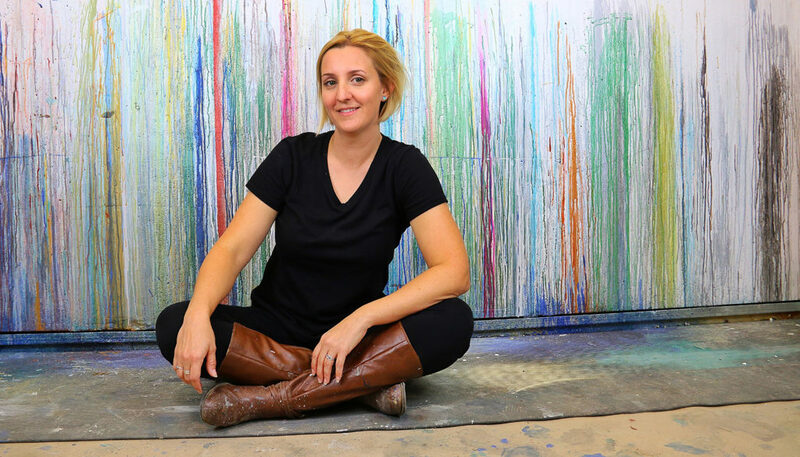 I craved working large and felt at home pouring paint and working on the floor. This time in my life was filled with newness and my art reflected that openness and the endless possibilities on the horizon. After college and the start of my professional career, I found myself in an environment that was more an apprenticeship than a job. I was asked to do and create many items that I would have never chosen to do myself. It pushed me out of my comfort zone and truly broadened my talents. This period allowed me to try new techniques, mediums and substrates and to learn how to use them successfully. Much of the art I created during this time was, in a way, a study or test. Being given the opportunity to explore like this helped me realize what comes naturally to me and who I wanted to be as an artist. Presently, I feel that things have come full circle. I am now back in the mindset of limitless possibilities that I had when I first began painting. I find myself pouring paint and working on the floor once again. However there is one major difference this time. I now have years of experimenting guiding me…telling me to remember all the successes and failures and to trust that I am capable of anything. AM: I was raised in the far West Phoenix Valley near the White Tank Mountains. The homes in the community where I grew up have enough land to raise animals and are surrounded by crop fields. The air is quiet out there; except for the occasional sound of fighter jets from nearby Luke Air Force Base. I am lucky enough to have made my way back to this place and I currently have my studio near where I grew up. The building where my art studio is housed is a roughly 3000 sqft. shop that I share with my father and his passion for cars. Thankfully, I was given this opportunity and I now have more than enough room to work on multiple pieces and projects at a time. The shop has two bay doors and it fills me with happiness every time I open them letting in the fresh air and light. 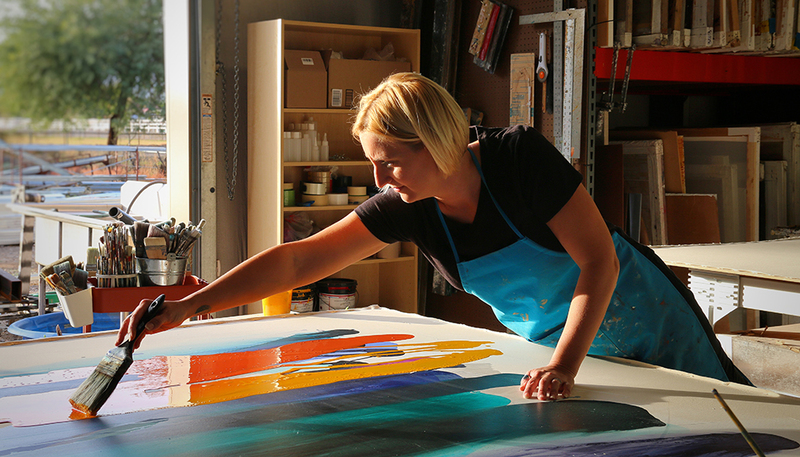 In my studio, I have much at my disposal. Beyond the typical supplies of paints and tools I have a large easel wall, a few tables, a rack of large silk screens and a Griffin printing presses for etching, intaglio and lithography. Weighing 2,000 pounds the press bed measures around 4′ x 6′ and was an undertaking to move and reassemble. I also have many plates to use in the press and am bubbling with excitement to use this technique in my future art. Together 2, Acrylic on Canvas, 30 × 30 in. AM: My inspiration does not typically come from a specific attribute, instead I believe it is a feeling. The exhilaration of creating, of making something from nothing is what drives me. This excitement keeps me going through the entire painting process. I do not feel particularly grounded in a certain subject, media, or style and I revel in that freedom. I do however, feel grounded in the challenge of making a work of art that I am proud of and others enjoy.